Feel welcome in your holiday apartment Thalerhof! Furnished with meticulous attention to detail, the two cosy holiday apartments Thalerhof reflect the warm and genuine hospitality of the Gargitter family. In the midst of the holiday region Cattinaccio / Latemar you can enjoy a modern living environment in a homely accommodation. 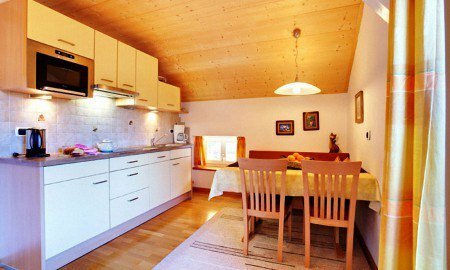 In the two apartments in Val d’Ega, furniture made of natural wood guarantee a pleasant atmosphere and will transform your holiday accommodation into a cosy holiday home in South Tyrol. 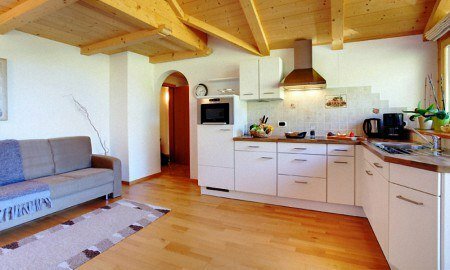 In summer and in winter, the Holiday apartment “Lavendel” offers space for up to 4 persons, while the apartment “Thymian” offers an excellent accommodation for 2-4 persons during adventurous vacations in the Dolomites. Since the apartments on the Thalerhof are suitable for allergic persons, pets are not allowed; anyhow, in your holiday apartment Thalerhof, thanks to hypoallergenic sheets, the non-smoking environment and the wood interiors, you will enjoy most hygienic comforts.